Who Dominates the Bowls Between the SEC and ACC? One of the biggest debates among avid college football fans, especially in the South, is whether or not the SEC or the ACC is more dominant. Some critics argue that the SEC is superior, while others argue that the ACC can compete at the same level. From 2006-2012, the SEC won seven straight national championships. During this time, the SEC clearly dominated college football, and it was clear that it was the superior conference. However, things seem to have been tracking positively for the ACC over the past five years. Many still argue the SEC is more dominant, but the numbers show that, in bowl games, the SEC and ACC are comparable. 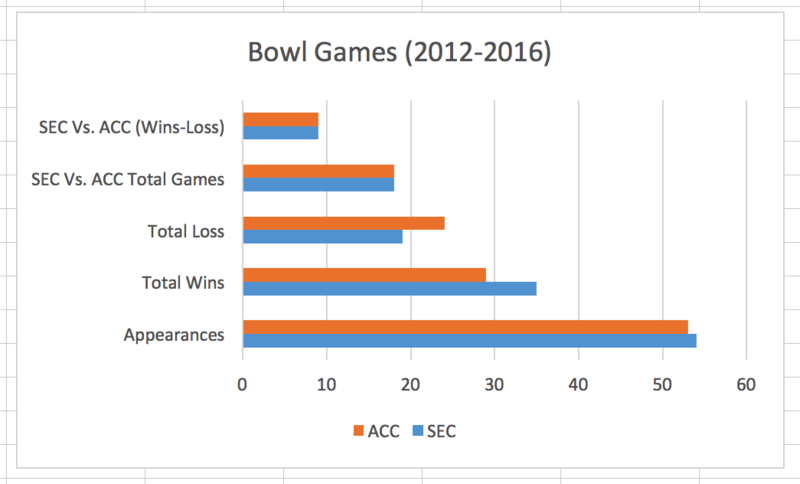 The chart above gives a breakdown of every SEC and ACC bowl game appearance over the last five years. The SEC has had 54 bowl game appearances while the ACC has had 53. As a point of reference, in order to make a bowl game, a team must have at least six wins during the regular season, so they have to be half-way decent to be eligible. The biggest piece of separation between the two conferences is in total wins and losses, as the SEC shows solid dominance in this area. Over the past five bowl seasons, the SEC has had 35 wins and 19 losses, giving them a win percentage of 64%. The ACC, on the other hand, has won 29 games over the last five bowl seasons and lost 24 of their games, leaving them with a win percentage of 54%. Both conferences have a bowl game win percentage of over 50%, which is strong, to be sure, but in comparison to each other, the SEC wins this category. The final category is one that holds maybe the most weight when looking at the debate of whether or not the SEC is superior to the ACC. The fourth section on the bar graph shows the total amount of games played between teams within the two different conferences, otherwise known as interleague bowl game matchups. Over the last five bowl seasons, there have been 18 games played between SEC and ACC teams. Each conference has had nine wins and nine losses. Considering that teams that are typically in the top tier of their conference play in bowl games, it can be inferred that the top teams in the ACC match up fairly well with the top teams in the SEC, despite their differences in overall win percentage. This year ten ACC teams will be participating in bowl games, while 9 SEC teams will be playing in games of their own. There will be three games played between ACC and SEC teams, one being the playoff game between Clemson and Alabama. This is the third year in a row that Clemson and Alabama have matched up in the College Football Playoff, but it is the first year that they are not playing each other in the championship game. Both teams have one loss during the regular season, with Clemson’s loss being to Syracuse, while Alabama lost to Auburn, a team Clemson actually beat earlier in the season. The early numbers are looking to be in Clemson’s favor. Clemson is 2-0 all-time in the College Football Playoff semi-final game, and 1-1 against Alabama in the playoff overall. This game is looking like it will be extremely close in score, and the winner has high chances to win the National Championship. The other ACC vs. SEC matchups are between Wake Forest and Texas A&M, and Louisville and Mississippi State. Wake Forest and Texas A&M both have 7 wins and 5 losses and Louisville and Mississippi State each have 8 wins and 4 losses. Both Texas A&M and Mississippi State will be playing under transitioning coaching staffs, and Mississippi State is playing without their injured starting quarterback, Nick Fitzgerald, too boot. The numbers are lining up for the ACC to have a solid bowl season against the SEC, but all three games are looking to be close and competitive. All in all, statistics are not 100% reliable all the time, but are useful in most predictive circumstances. Overall, the SEC and ACC are extremely comparable in bowl games over the past five years. The SEC appears to be slightly stronger, but these numbers do indicate that the SEC is not the Goliath of all College Football conferences like it is sometimes made out to be. It should be respected because it is one of the best, but the ACC can hold its own against teams of the SEC’s caliber. This blog post was written by Samford University student Garrett Galloway.